I n this day and age, there are so many ways that you can improve your smile from porcelain veneers, self-ligating orthodontic braces as well crowns. But before any of these technologies were ever available, dental bonding was already an acceptable means of improving your smile. This procedure involves the use of composite resin, a special kind of dental cement which can be used to sculpt your teeth for aesthetic as well as reconstructive purposes. In the past, dental bonding was only an alternative for a dental treatment for tooth decay and cavities. The first form of filling material which was used is the all-metal or the dental amalgam. However, because this form of dental filling material was often colored and can be conspicuously seen against the whiteness of your teeth, composite resin material, which has the same color as your teeth, was developed. What was supposed to be used only for filling in cavities is now used for other purposes such as composite resin veneers. While diastemas were considered as amazing beautifiers, at least in the past, this isn’t the case anymore. Diastemas are also seen as gaps in between your teeth. These gaps only indicate that you have a malocclusion or a bite problem. 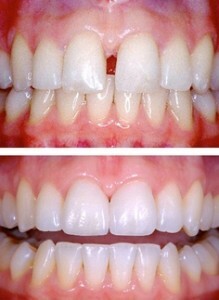 Because of the improper way that your teeth are spaced, then a gap has basically formed as a result. Gaps can be closed with the help of braces, by moving teeth closer together, but widening your teeth with the help of dental bonding using composite resin veneers is actually an easier solution. Sometimes, a game of baseball goes horribly wrong and your teeth suffers for your temporary inability to catch a ball that is moving in high velocity. In order to seal in chips and fractures which have developed as a consequence, dental bonding with composite resin material may be used to reconstruct your affected tooth. Internal dental stains are a lot harder to get rid of especially since they are isolated in the inner layers. This means that the tooth would considerably become damaged when the hydrogen peroxide gel is used. On the other hand, concealing the internal dental stain is a surer and safer way to go with regards to getting rid of the stain.